Czech Young Greens: The First Climate Camp a Success! Limity Jsme My is an open grassroots civic movement against coal mining and coal burning. Their first public event, dedicated to memory of the Northern Bohemia towns demolished for the coal mining, was held in February 2015. There were memorials held in fourteen different places in the country and the message was clear: We are against breaking of the brown coal mining limits and against further expansion of the coal industry. The same year, in June, we continued with the protests in more than twenty places which were joined by more than a thousand people. The protests were supported by our allies in Germany, Belgium, Finland and Brazil. The first climate camp in the Czech Republic – Klimakemp, took take place in the North-Bohemian mining region from 21st to 25th of June 2017. From Wednesday to Sunday, more than 300 people came to the North-Bohemian town of Horní Jiřetín from Czechia, Slovakia, Germany, Poland, Austria, Hungary, Sweden, Romania, Italy, Belgium, Lithuania, France, Russia, and USA. They all took part in talks, workshops and other activities and lived together in a camp governed by principles of sustainability. Our goal was to teach and learn, meet each other, get to know each other and most importantly fight for climate justice. In order to draw attention to the problem of climate change, on Saturday we organized several very successful legal protests and a mass action of non-violent civil disobedience. Approximately 300 people marched against fossil fuel mining and for a clean energy future on Saturday morning. We created a red line with our own bodies on the border of the allowed coal mining area on top of the ČSA lignite pit. 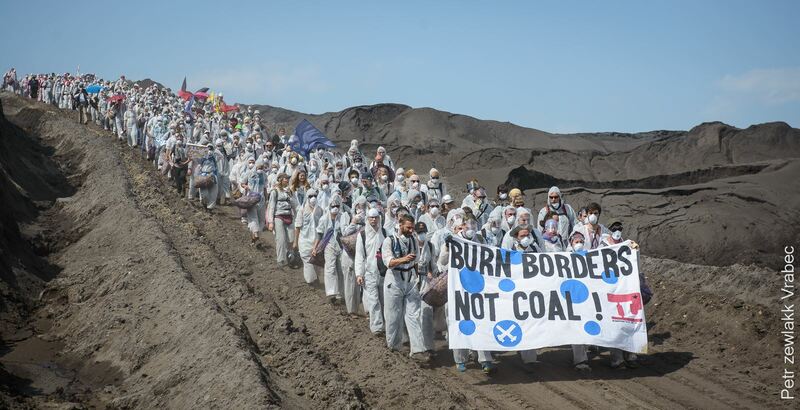 In doing so, we wanted to express that every individual person can try to stop climate change if he or she takes a stand against coal mining and becomes its literal limit. Shortly after that, 144 of us entered a lignite mining site Bílina. We reached the bottom of the pit in high spirits and without being stopped by the police. When the riot police arrived, we formed a blockade under a digger which had to be broken through by securing people individually. We were all handcuffed, taken to nearby towns to police stations for interrogation, and released after several hours. Several of us did not receive any water during a 12 hour detainment. plant. They decided to occupy the site for a few hours. During the day of action, we carried out two other legal happenings – a demonstration in front of the Ledvice coal power plant and a bike ride around the border of the ČSA mine. Even though the bike ride consisted only of six people, the police decided to follow them by two vans filled with riot officers and a police helicopter. The first Czech Klimakemp exceeded all of our expectations. We succeeded in stopping the mining at three lignite mines (Bílina, ČSA, Vršany). Our nonviolent protest was received positively by the media. We consider it a big success that we noticed support from the general public, the miners themselves, and the locals living in the area of the Most lignite region. Climate activists spent several days making friendships, enjoying the moment, and working toward climate justice. They had time and resources to plan more events that will further the cause of the global climate justice movement. We hope that even more people will come next year, and that we will continue the very successful legacy of the first year. solely up to us whether we allow the coal mining industry to destroy our planet and our health, or whether we stand up to fight for a sustainable future. Learn more about how you can get involved HERE! This entry was posted in Members' News, News, Uncategorized. Bookmark the permalink.